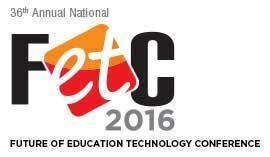 The National Future of Education Technology Conference (FETC) today announced the 19 companies that will demonstrate their ed tech solutions as part of the 2017 FETC Startup Pavilion, located in the conference’s exposition hall. Taking place January 24 – 27, 2017 at the Orange County Convention Center in Orlando, Fla., the conference aims to connect attendees with today’s most innovative technologies and applications in the ed tech space, including those from the newest startups making their mark on the industry. 5-A-Day Fitness, Brainspace, Chalk.com, CodeMonkey, CueThink, Edcoda, ETIN, InstaVR,Koantum, Moxie Reader, Noodle Markets, Nutri-Link Technologies, Permission Click Inc., Planet3, Quick Key, SchooLinks, Spark Innovation, Educational Research + Innovation Hub (ihub) and ThingLink. As part of the Startup Pavilion, each company will provide FETC attendees with hands-on demonstrations of their innovations and show how these solutions can make a difference in their schools and districts.